Not to be confused with Malay script. Malayalam script (Malayāḷalipi; IPA: [mələjɑːɭə lɪpɪ] ( listen) / Malayalam: മലയാളലിപി) is a Brahmic script used commonly to write the Malayalam language, which is the principal language of Kerala, India, spoken by 35 million people in the world. Malayalam script is also widely used for writing Sanskrit texts in Kerala. Like many other Indic scripts, it is an alphasyllabary (abugida), a writing system that is partially “alphabetic” and partially syllable-based. The modern Malayalam alphabet has 15 vowel letters, 36 consonant letters, and a few other symbols. The Malayalam script is a Vatteluttu alphabet extended with symbols from the Grantha alphabet to represent Indo-Aryan loanwords. The script is also used to write several minority languages such as Paniya, Betta Kurumba, and Ravula. The Malayalam language itself was historically written in several different scripts. An independent vowel letter is used as the first letter of a word that begins with a vowel. A consonant letter, despite its name, does not represent a pure consonant, but represents a consonant + a short vowel /a/ by default. For example, ക is the first consonant letter of the Malayalam alphabet, which represents /ka/, not a simple /k/. A vowel sign is a diacritic attached to a consonant letter to indicate that the consonant is followed by a vowel other than /a/. If the following vowel is /a/, no vowel sign is needed. The phoneme /a/ that follows a consonant by default is called an inherent vowel. In Malayalam, its phonetic value is unrounded [ɐ], or [ə] as an allophone. To denote a pure consonant sound not followed by a vowel, a special diacritic virama is used to cancel the inherent vowel. The following are examples where a consonant letter is used with or without a diacritic. Malayalam alphabet is unicase, or does not have a case distinction. It is written from left to right, but certain vowel signs are attached to the left (the opposite direction) of a consonant letter that it logically follows. In the word കേരളം (Kēraḷam), the vowel sign േ (ē) visually appears in the leftmost position, though the vowel ē logically follows the consonant k.
Malayalam was first written in the Vatteluttu alphabet, an ancient script of Tamil. However, the modern Malayalam script evolved from the Grantha alphabet, which was originally used to write Sanskrit. Both Vatteluttu and Grantha evolved from the Tamil-Brahmi, but independently. Vattezhuthu (Malayalam: വട്ടെഴുത്ത്, Vaṭṭezhuthŭ ?, “round writing”) is a script that had evolved from Tamil-Brahmi and was once used extensively in the southern part of present-day Tamil Nadu and in Kerala. Malayalam was first written in Vattezhuthu. The Vazhappally inscription issued by Rajashekhara Varman is the earliest example, dating from about 830 CE. In the Tamil country, the modern Tamil script had supplanted Vattezhuthu by the 15th century, but in the Malabar region, Vattezhuthu remained in general use up to the 17th century, or the 18th century. A variant form of this script, Kolezhuthu, was used until about the 19th century mainly in the Kochi area and in the Malabar area. Another variant form, Malayanma, was used in the south of Thiruvananthapuram. According to Arthur Coke Burnell, one form of the Grantha alphabet, originally used in the Chola dynasty, was imported into the southwest coast of India in the 8th or 9th century, which was then modified in course of time in this secluded area, where communication with the east coast was very limited. It later evolved into Tigalari-Malayalam script was used by the Malayali, Havyaka Brahmins and Tulu Brahmin people, but was originally only applied to write Sanskrit. This script split into two scripts: Tigalari and Malayalam. While Malayalam script was extended and modified to write vernacular language Malayalam, the Tigalari was written for Sanskrit only. In Malabar, this writing system was termed Arya-eluttu (ആര്യ എഴുത്ത്, Ārya eḻuttŭ), meaning “Arya writing” (Sanskrit is Indo-Aryan language while Malayalam is a Dravidian language). Vatteluttu was in general use, but was not suitable for literature where many Sanskrit words were used. Like Tamil-Brahmi, it was originally used to write Tamil, and as such, did not have letters for voiced or aspirated consonants used in Sanskrit but not used in Tamil. For this reason, Vatteluttu and the Grantha alphabet were sometimes mixed, as in the Manipravalam. One of the oldest examples of the Manipravalam literature, Vaishikatantram (വൈശികതന്ത്രം, Vaiśikatantram), dates back to the 12th century, where the earliest form of the Malayalam script was used, which seems to have been systematized to some extent by the first half of the 13th century. Thunchaththu Ezhuthachan, a poet from around the 17th century, used Arya-eluttu to write his Malayalam poems based on Classical Sanskrit literature. For a few letters missing in Arya-eluttu (ḷa, ḻa, ṟa), he used Vatteluttu. His works became unprecedentedly popular to the point that the Malayali people eventually started to call him the father of the Malayalam language, which also popularized Arya-eluttu as a script to write Malayalam. However, Grantha did not have distinctions between e and ē, and between o and ō, as it was as an alphabet to write a Sanskrit language. The Malayalam script as it is today was modified in the middle of the 19th century when Hermann Gundert invented the new vowel signs to distinguish them. By the 19th century, old scripts like Kolezhuthu had been supplanted by Arya-eluttu – that is the current Malayalam script. Nowadays, it is widely used in the press of the Malayali population in Kerala. Malayalam and Tigalari are sister scripts are descended from Grantha alphabet. Both share similar glyphic and orthographic characteristics. In 1971, the Government of Kerala reformed the orthography of Malayalam by a government order to the education department. The objective was to simplify the script for print and typewriting technology of that time, by reducing the number of glyphs required. In 1967, the government appointed a committee headed by Sooranad Kunjan Pillai, who was the editor of the Malayalam Lexicon project. It reduced number of glyphs required for Malayalam printing from around 1000 to around 250. Above committee's recommendations were further modified by another committee in 1969. This proposal was later accepted by major newspapers in January 1971. The reformed script came into effect on 15 April 1971 (the Kerala New Year), by a government order released on 23 March 1971. In the traditional orthography, that had been taught in the primary education till that time, any consonant or consonant ligature followed by the vowel sign of u, ū, or r̥ are represented by a cursive consonant-vowel ligature. The glyph of each consonant had its own way of ligating with these vowel signs. This irregularity was simplified in the reformed script. As per that, a vowel sign or the consonant sign would always have a disconnected symbol that does not fuse with the base consonant. In traditional orthography, the reph is represented by a dot over the subsequent letter. Instead of that, explicit stand-alone Chillu ṟa would be used. Any consonant or consonant ligature followed by the conjoining ra is represented by a cursive tail attached to the consonant or the consonant-ligature. In the reformed script, this consonant sign would be disconnected from the base and represented as a left-bracket like symbol placed on the left side of the cluster. Today the reformed orthography, is commonly called put̪iya lipi (Malayalam: പുതിയ ലിപി, ?) and traditional system, paḻaya lipi (Malayalam: പഴയ ലിപി, ?). Current print media almost entirely uses reformed orthography. The state run primary education introduces the Malayalam writing to the pupils in reformed script only and the books are printed accordingly. However, the digital media uses both traditional and reformed in almost equal proportions as the fonts for both the orthographies are commonly available. 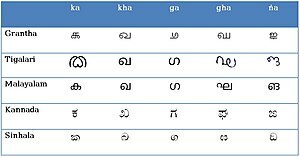 The following tables show the independent vowel letters and the corresponding dependent vowel signs (diacritics) of the Malayalam script, with romanizations in ISO 15919, transcriptions in the International Phonetic Alphabet (IPA). A Malayalam sign. Notice the word-initial a അ in akkādami, and the vowel sign ē േ in Kēraḷa. r̥, r̥̄, l̥, l̥̄, used to write Sanskrit words, are treated as vowels. They are called semi-vowels and are phonetically closer to vowels in Malayalam and in Classical Sanskrit where pANinI, the Sanskrit grammarian, groups them with vowel sounds in his sUtras. (see Proto-Indo-European language and Vedic Sanskrit). The letters and signs for r̥̄, l̥, l̥̄ are very rare, and are not considered as part of the modern orthography. The vowel signs ā, i, ī are placed to the right of a consonant letter to which it is attached. The vowel signs e, ē, ai are placed to the left of a consonant letter. The vowel signs o and ō consist of two parts: the first part goes to the left of a consonant letter and the second part goes to the right of it. In the reformed orthography, the vowel signs u, ū, r̥ are simply placed to the right of the consonant letter, while they often make consonant-vowel ligatures in the traditional orthography. It is important to note the vowel duration as it can be used to differentiate words that would otherwise be the same. For example, /kalam/ means "earthenware pot" while /kaːlam/ means "time" or "season". An anusvaram (അനുസ്വാരം anusvāram), or an anusvara, originally denoted the nasalization where the preceding vowel was changed into a nasalized vowel, and hence is traditionally treated as a kind of vowel sign. In Malayalam, however, it simply represents a consonant /m/ after a vowel, though this /m/ may be assimilated to another nasal consonant. It is a special consonant letter, different from a "normal" consonant letter, in that it is never followed by an inherent vowel or another vowel. In general, an anusvara at the end of a word in an Indian language is transliterated as ṁ in ISO 15919, but a Malayalam anusvara at the end of a word is transliterated as m without a dot. A visargam (വിസർഗം, visargam), or visarga, represents a consonant /h/ after a vowel, and is transliterated as ḥ. Like the anusvara, it is a special symbol, and is never followed by an inherent vowel or another vowel. The following tables show the basic consonant letters of the Malayalam script, with romanizations in ISO 15919, transcriptions in IPA, and Unicode CHARACTER NAMES. The character names used in the report of the Government of Kerala committee (2001) are shown in lowercase italics when different from Unicode character names. Those alternative names are based on the traditional romanization used by the Malayali people. For example, tha in “Thiruvananthapuram” is neither ISO tha nor Unicode THA, but tha in this sense (ത). The ISCII (IS 13194:1991) character names are given in parentheses when different from the above. The consonants /ʈ, ɖ, ɳ/ are retroflex. In Malayalam, they are produced by touching the underside of the tip of the tongue to the front part of the hard palate (apico-palatal). A Dental nasal or alveolar nasal, depending on the word. C The tip of the tongue almost touches the teeth ([l̪]), forward than the English l.
F Voiceless apico-palatal approximant [ʂ̺̠˕]. G Dental sibilant fricative [s̪]. I This glyph is a ligature (KA + VIRAMA + SSA), but is sometimes listed as a basic unit. Often pronounced /ʈ͡ʂa/. J Voiced apico-palatal approximant [ʐ̺̠˕]. This consonant is usually described as /ɻ/, but also can be approximated by /ɹ/. K (1) Repetition of this letter (റ + റ) often represents a geminated voiceless alveolar plosive, /tːa/; (2) chillu-n + this letter (ൻ + റ) often represents /nda/; (3) otherwise alveolar trill (apical) /ra/. Optionally, (1) may be transliterated as ṯṯa instead of ṟṟa, (2) as nṯa (not nḏa) instead of nṟa. L Corresponds to Tamil ṉa ன. Used rarely in scholarly texts to represent the alveolar nasal, as opposed to the dental nasal. In ordinary texts both are represented by na ന.
M Used rarely in scholarly texts to represent the voiceless alveolar plosive, as opposed to the voiceless dental plosive represented by ta ത. In ordinary texts this sound is represented by ṟa റ. A chillu, or a chillaksharam (ചില്ലക്ഷരം, cillakṣaram), is a special consonant letter that represents a pure consonant independently, without help of a virama. Unlike a consonant represented by an ordinary consonant letter, this consonant is never followed by an inherent vowel. Anusvara and visarga fit this definition but are not usually included. ISCII and Unicode 5.0 treat a chillu as a glyph variant of a normal (“base”) consonant letter. In Unicode 5.1 and later, however, chillu letters are treated as independent characters, encoded atomically. There are at least six known chillu letters. Chillu-k is rare. The other five are quite common. CHILLU RR ra ര Historically from ra, not from ṟa (RRA) റ.
CHILLU L la ല Historically from ta ത.
Chandrakkala ് (ചന്ദ്രക്കല, candrakkala) is a diacritic attached to a consonant letter to show that the consonant is not followed by an inherent vowel or any other vowel (for example, ക ka → ക് k). This kind of diacritic is common in Indic scripts, generically called virama in Sanskrit, or halant in Hindi. At the end of a word, the same symbol sometimes represents a very short vowel, known as “half-u”, or samvruthokaram (സംവൃതോകാരം, saṁvr̥tōkāram), or kuṯṯiyal ukaram (കുറ്റിയൽ ഉകരം). The exact pronunciation of this vowel varies from dialect to dialect, but it is approximately [ə] or [ɨ], and transliterated as ŭ (for example, ന na → ന് nŭ). Optionally, a vowel sign u is inserted, as in നു് (= ന + ു + ്). According to one author, this alternative form is historically more correct, though the simplified form without a vowel sign u is common nowadays. This means that the same spelling ന് may represent either n or nŭ depending on the context. Generally, it is nŭ at the end of a word, and n elsewhere; നു് always represents nŭ. ന്‌ (na + virama) represents a dead consonant n.
If this n ന്‌ is further followed by another consonant letter, for example, ma മ, the result may look like ന്‌മ, which represents nma as na + virama + ma. In this case, two elements n ന്‌ and ma മ are simply placed one by one, side by side. Alternatively, nma can be also written as a ligature ന്മ. If the result is fully or half-conjoined, the (conceptual) virama which made C1 dead becomes invisible, only logically existing in a character encoding scheme such as Unicode. If the result is non-ligated, a virama is visible, attached to C1. The glyphs for nma has a visible virama if not ligated (ന്‌മ), but if ligated, the virama disappears (ന്മ). Usually the difference between those forms is superficial and both are semantically identical, just like the meaning of the English word palaeography does not change even if it is spelled palæography, with the ligature æ. Several consonant-consonant ligatures are used commonly even in the new orthography. The ligature mpa മ്പ was historically derived from npa ന്‌പ. The ligatures cca, bba, yya, and vva are special in that a doubled consonant is denoted by a triangle sign below a consonant letter. In kya ക്യ, a variant form of ya ( ) is placed after the full form of ka ക, just like ki കി is written ka ക followed by the vowel sign i ി. In other words, the variant form of ya ( ) used after a consonant letter can be considered as a diacritic. Since it is placed after the base character, it is sometimes referred to as a post-base form. An exception is yya യ്യ (see above). An exception is vva വ്വ (see above). (3) The consonant letter la after a consonant traditionally takes a below-base form. These forms are used also in the new orthography, though some fonts do not support them. (4) A consonant letter ra after a consonant usually takes a pre-base form in the reformed orthography, while this combination makes a fully conjoined ligature in the traditional orthography. The ligature nṯa is written as n ന്‌ + ṟa റ and pronounced /nda/. The ligature ṯṯa is written as ṟ റ് + ṟa റ. In those two ligatures, a small ṟa ‌റ is written below the first letter (chillu-n if it is a dead n). Alternatively, the letter ṟa is sometimes written to the right of the first letter, making a digraph (just like ωι used instead of ῳ in Greek). The spelling ൻറ is therefore read either nṟa (two separate letters) or nṯa (digraph) depending on the word. Similarly, ‌റ‌റ is read either ṟaṟa or ṯṯa. In the traditional orthography, a dead consonant r before a consonant sometimes takes an above-base form, known as a dot reph, which looks like a short vertical line or a dot. Generally, a chillu-r is used instead of a dot reph in the reformed orthography. ഽ Corresponds to Devanagari avagraha, used when a Sanskrit phrase containing an avagraha is written in Malayalam script. The symbol indicates the elision of the word-initial vowel a after a word that ends in ā, ē, or ō, and is transliterated as an apostrophe (’), or sometimes as a colon + an apostrophe (:’). । Archaic punctuation marks used as full stops or for delimiting verses. Malayalam numbers and fractions are written as follows. These are archaic and no longer commonly used. Malayalam script was added to the Unicode Standard in October, 1991 with the release of version 1.0. For example, avan അവൻ (“he”) is written as a അ + va വ + chillu-n ൻ, where chillu-n represents the n sound without a vowel. In other Indic scripts, the same word would be possibly written as a + va + na + virama. However, in Malayalam script, that sequence represents a different word, avanŭ അവന്‌ (“to him”), and is not interchangeable with avan. This is because in modern Malayalam script, the sign for a virama also works as the sign for a vowel ŭ at the end of a word, and is not able to cleanly “kill” the inherent vowel in this case. To differentiate a pure consonant (chillu) and a consonant with ŭ, zero-width joiner (ZWJ) and zero-width non-joiner (ZWNJ) were used before Unicode 5.1. However, this system was problematic. Among other things, glyph variants specified by ZWJ or ZWNJ are supposed to be non-semantic, whereas a chillu (expressed as letter + virama + ZWJ) and the same consonant followed by a ŭ (expressed as letter + virama + ZWNJ) are often semantically different. After a long debate, six chillus now have their own code points starting from Unicode 5.1, though applications should also be prepared to handle data in the representation specified in Unicode 5.0. This means, fonts should display chillus in both sequences; while an input method should output standard chillus. The ligature nṯa is very common and supported by most Malayalam fonts in one way or another, but exactly how it should be encoded was not clear in Unicode 5.0 and earlier, and two incompatible implementations are currently in use. In Unicode 5.1 (2008), the sequence to represent it was explicitly redefined as chillu-n + virama + ṟa (ൻ്റ). ^ a b c "Malayalam aer". Omniglot. 1998. Retrieved 2009-09-08. Cite error: Invalid <ref> tag; name "Omniglot" defined multiple times with different content (see the help page). ^ a b "Vazhapally Temple". Vazhappally Sree Mahadeva Temple. Archived from the original on 2011-01-09. Retrieved 2009-10-31. ^ Lewis, M. Paul, ed. (2009). "Malayalam". Ethnologue: Languages of the World (16th ed.). SIL International. Retrieved 2009-10-31. ^ Krishnamurti, Bhadriraju (2003). The Dravidian Languages. Cambridge University Press. p. 85. ^ Ethnologue (16th ed. ): "Paniya", "Kurumba, Betta", and "Ravula". ^ Canepari (2005), pp. 396, 140. ^ Burnell (1874), p. 39. ^ a b "The Script". Malayalam Resource Centre. Retrieved 2009-11-20. ^ a b "Alphabets". Government of Kerala. Archived from the original on 2009-11-09. Retrieved 2009-10-29. ^ a b c d Burnell (1874), p. 35. ^ "Grantha alphabet". Encyclopædia Britannica Online. Encyclopædia Britannica. 2009. Retrieved 2009-10-28. ^ "EPIGRAPHY - Inscriptions in Grantha Script". Department of Archaeology, government of Tamil Nadu. Retrieved 2009-11-11. ^ Nampoothiri, N. M. (1999), "Cultural Traditions in Medieval Kerala" (PDF) in Cherian, P. J., Perspectives on Kerala History: The Second Millennium, Kerala Council for Historical Research, ISBN 81-85499-35-7, retrieved 2009-11-20. ^ "Development of Literature". Malayalam Resource Centre. Retrieved 2009-11-20. ^ Andronov, Mikhail Sergeevich. A Grammar of the Malayalam Language in Historical Treatment. Wiesbaden : Harrassowitz, 1996. ^ "Malayalam Script—Adoption of New Script for Use—Orders Issued" (PDF). Government of Kerala. 1971. Retrieved 2009-10-25. ^ "Malayalam by R. E. Asher, T. C. Kumari". ^ John, Vijay. "The Concept of ലിപി (Lipi)". Learn Malayalam Online!. Retrieved 2009-09-08. ^ a b "Report of the Committee on Malayalam Character Encoding and Keyboard Layout Standardisation". Kerala Gazette. Government of Kerala. 46 (2023). December 18, 2001. Archived from the original on October 6, 2009. Retrieved 2009-10-08. See also the May 2001 version Archived 2010-01-31 at the Wayback Machine (PDF). ^ Asher, R. E. Malayalam. Ed. T. C. Kumari 1934-. London ; New York : Routledge, 1997. ^ a b Canepari (2005), pp. 397, 185. ^ a b Everson, Michael (2007). "Proposal to add two characters for Malayalam to the BMP of the UCS" (PDF). ISO/IEC JTC1/SC2/WG2 N3494. Retrieved 2009-09-09. ^ a b "South Asian Scripts-I" (PDF). The Unicode Standard 5.0 — Electronic Edition. Unicode, Inc. 1991–2007. pp. 42–44. Retrieved 2009-09-08. ^ a b c d "Malayalam Chillu Characters". Unicode 5.1.0. Unicode, Inc. 2008. Retrieved 2009-09-10. ^ Chitrajakumar, R; Gangadharan, N (2005-08-07). "Samvruthokaram and Chandrakkala" (PDF). Unicode Consortium. Archived (PDF) from the original on 2014-07-12. Retrieved 2010-08-23. ^ a b c Muller, Eric (2006). "Malayalam cillaksarams" (PDF). JTC1/SC2/WG2 N3126 L2/06-207. Retrieved 2009-09-10. ^ a b Chitrajakumar, R. & Gangadharan, N. (2005). "Chandrakkala. Samvruthokaram. Chillaksharam" (PDF). L2/05-210. Retrieved 2009-09-10. ^ Constable, Peter (2004). "Clarification of the Use of Zero Width Joiner in Indic Scripts" (PDF). Public Review Issue #37. Unicode, Inc. Retrieved 2009-09-10. ^ Johny, Cibu C. (2005). "Unicode Public Review Issue #66: Encoding of Chillu Forms in Malayalam". Retrieved 2009-09-16. See also L2/05-085 (PDF). ^ "Encoding of Chillu Forms in Malayalam". Public Review Issue #66]. Unicode, Inc. 2005. Retrieved 2009-09-24. Mohanan, K. P. (1996). "Malayalam Writing". In Daniels, Peter T. & Bright, William (eds.). The World's Writing Systems. New York: Oxford University Press. Burnell, Arthur Coke (1874). Elements of South-Indian Palæography from the Fourth to the Seventeenth Century A.D. Trübner & Co.
Canepari, Luciano (2005). "19.29 Malayalam". A Handbook of Phonetics. LINCOM. ISBN 3-89586-480-3. Wikivoyage has a travel guide for Malayalam phrasebook. This page was last edited on 8 April 2019, at 12:29 (UTC).